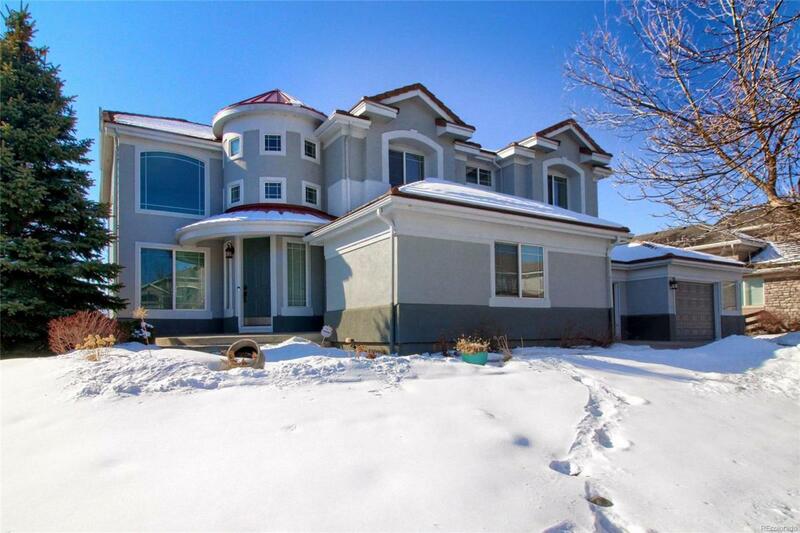 Updated 5-bedroom home with walkout basement that backs to golf course and wetlands. The oversized 4++ car garage could easily fit 4 cars, and bikes, jet skis, motorcycles (you get the idea). Soaring ceilings in entry and Living room. The kitchen features an enormous center island granite, counters, stainless steel appliances. Kitchen flows into the family room and out onto the covered deck. Perfect for entertaining. Spacious master suite. Walk in shower, separate soaking tub and large walk in closet. Private deck off the master. 3 additional bedrooms and 2 baths and laundry upstairs. Finished walkout basement with wet bar tons of living space and an additional bedroom and bath. Gated neighborhood. Private streets maintained by the HOA. Cul-de-sac. Great mountain views. Convenient location with easy access to downtown, DTC or a quick trip to the mountains. New paint in the last year. Beautiful home, golf community. Look no further. Quick possession available.